When MSI opened for business in 1973, lumber was one of the first products we imported and stocked. Today, more than forty years later, it remains one of our most important product lines. Back in those days lumber was coming into the territory untreated. People were therefore regularly building with untreated material! We decided in an early “Island Tough” way to pioneer the importation and sale of only the highest grades of treated Southern Yellow Pine (SYP) lumber for our customers. Beyond treated SYP lumber we also stock Douglas Fir forming lumber, Cypress and Mahogany Lumber. 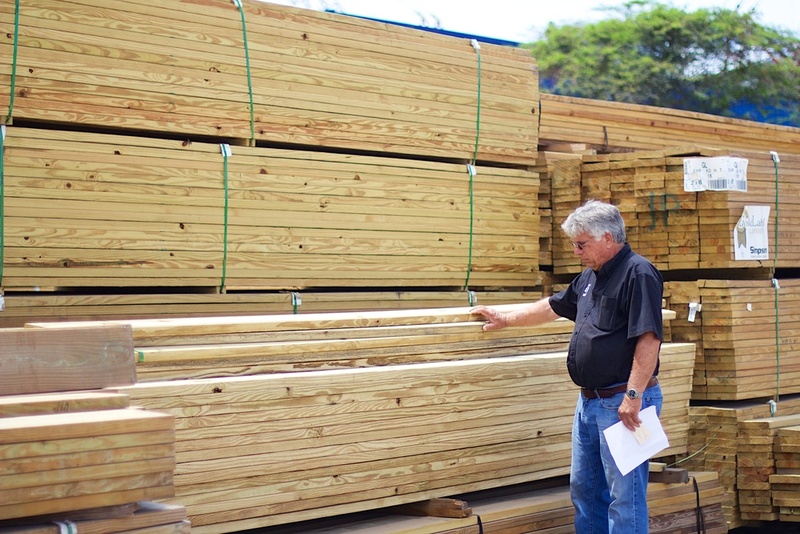 Tom Brunt, CEO, inspects a recent shipment of lumber. SYP has a long history of use in the Caribbean, over 350 years! Southern Pine Grade and Standards offers an in-depth explanation of the grades of lumber. You will also find a span tables to help determine what size material your job requires. MSI stocks untreated Standard & Better Douglas Fir lumber for concrete forming. This material is extraordinarily strong and more suitable for forming here in the USVI than other softwoods as it is more stable and resist twisting and deformation in our climate. Douglas Fir is the strongest of all of the softwoods but it is also more expensive. So the question is why would we want to use Douglas Fir when other cheaper material could be used? It turns out that the concrete and aggregates poured in the USVI weigh more and are denser than the concrete found in most other areas of the world. Having a stronger forming lumber means that our contractors will not have unnecessary and dangerous blowouts or other concrete form failures. The Western Wood Products Association (WWPA) has an informative discussion on the different softwood species. We stock #2 & Better 1x6 T&G (Tongue & Groove, Vee-groove) Cypress. MSI has stocked this material for years specifically for use in exposed ceilings. It’s light color and minimal grain offer many options to finishing the interior of a residence. Here is a link to cypressinfo.org. In addition to the species listed above we also supply Tropical Hardwoods from Latin America and Africa, for use in wood deck construction. 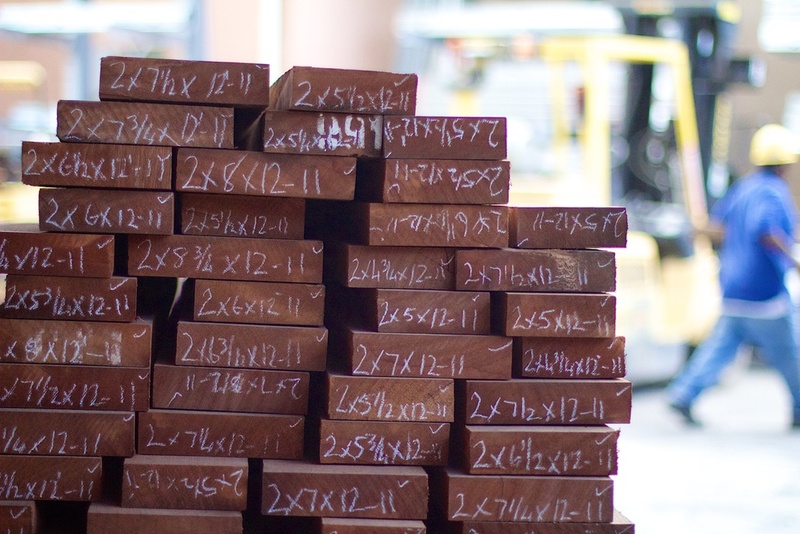 Mahogany, available only in random lengths, is stocked in 1" and 2" dimensions. Other Tropical Hardwoods we special order are: Iroko (also known as African Teak), Ipe, Cumape and Abaco. For customers who prefer composite lumber because it requires little to no maintenance, or for conservation reasons, Trex is stocked in 12' and 16' lengths. A blend of 95% recycled wood and plastic, they are the leader in eco-friendly composite decking. Trex is actually one of the largest plastic recyclers in the U.S. They keep 400 million pounds for wood and plastic from landfills each year. We stock Trex Select Saddle in 12' and 16' lengths. All other colors and grades may be special ordered as well, which usually takes about 3 weeks to arrive on island. MSI invests in relationships. We have long–standing multi–decade relationships with all of our lumber suppliers which allows us to guarantee that we are sourcing the best material available on the market today. We have also come to rely on our mill partners to help us supply any special order lumber sizes that we do not regularly stock. We have sourced Southern yellow Pine beams up to 32’ in length and we have also supplied treated wood composite (laminated) beams to many projects in the Caribbean.